Following the Piñata Challenger, Alex has finally won the last Head of House of Big Brother Naija season 3. Big Brother gave the House a run for its money, and plenty of money there was tonight. Housemates had to enter the glass booth in turn to try and grab the BBNaira notes that were flying around them. In the tight and confined glass booth, and only at the third round of a process of elimination, Alex bagged the Head of House crown to her utmost surprise. While Housemates clapped their hands of delight for her victory, she nonetheless looked anxious about what it entailed. Having checkmated all Housemates, Alex picked a card that granted her immunity and required that she chooses one Housemate to Save. Expectedly she chose her longstanding friend Tobi to share the luxury bedroom with as he couldn’t cease to praise her as his hands were joined in prayer. Alex’s card had her Save Nina who was exulting at the thought to be heading to the finale. Later during the Diary Session, Nina admitted to have always wanted Alex to be a leader, just like Anto, Khloe, Lolu, Tobi and Miracle who all wanted to see her in a leadership role. 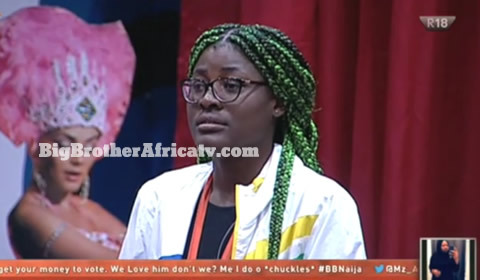 Yet Cee-C confessed that Alex was the one person she had ‘zero like’ for and seemed to fear that Housemates would frustrate her, especially Khloe as she predicted more fights. If only she knew that Khloe had warmly endorsed Alex. my King Cee-C is the boss!The money is yours my boss lady!